You hear it all the time - you want a sparky image for your website and the web designer says 'Oh, we'll just stick in a few cheap stock photos". Then when you see the photos they're either irrelevant to your business or they are the same bland images you see on everyone else's site. What's going on? Welcome to the restricted world of Royalty Free stock photos. Restricted? Royalty Free images can be used as I wish (you may say). If you bother to look at the huge license agreement you sign up to when buying a Royalty Free photo then you'll realise you're wrong, but that's another story. 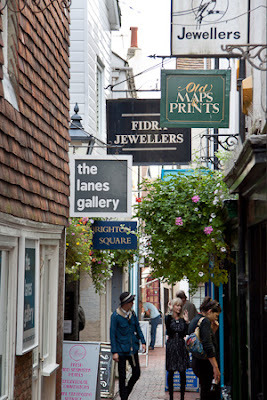 Brighton's Lanes is a tangled web of narrow streets with businesses and shops and shoppers and tourists squeezed into an atmospheric area which pulls in the crowds. 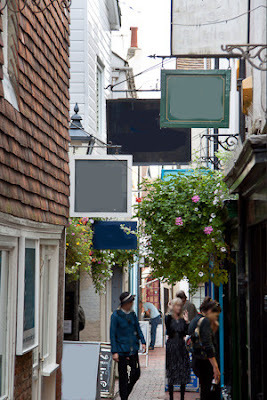 Let's suppose that you run a business on those streets and you want a photo for your website that shows a little of what the area's all about because people will then make a special journey to your business rather than go to a more boring area. You want a photo that's as cheap as possible naturally, but at the same you want a good photo because if that photo makes the place look as if it's worth visiting then that photo will help sell lots of your stuff! You've heard of istockphoto as a source of quality images. And indeed it can be. But when you go along and search on Brighton Lanes Shops you'd be surprised to find only one photo. And that's a rather disappointing image of a dirty looking street sign. You 'Add to Cart' and how much????!!! Why were you expecting to pay a dollar? Well, here's the same image that has been subject to a few changes that would allow it to be sold on one of those dollar a photo sites, if they allowed it on. (istockphoto certainly wouldn't because of fundamental quality issues as a result of the alterations). Can you spot the differences? Other than instant blandness. That's a game for you to play at home - but answers below! What's going on? Well fundamentally if photos are royalty free and the general perception is that then means that you can use the images how you wish then the suppliers of those images have to be ultra cautious about which images are made available. And since permission can't be obtained from random shoppers to feature their faces, and businesses to use their names and logos, well that means that this sort of image simply isn't available royalty free. Which means it's never going to sell in tens or hundreds. In fact it will probably never sell. However it's the sort of image that can be sold in the alternative 'Rights Managed' photo marketplace where the buyer has to specify how the image is to be used and the large business pays a lot more to use the image than a small business. With images like this, rather fewer than one in ten will ever be sold in any shape or form. And that's why that damn stock photo is expensive. It would not exist if the photographer had not gone out and speculatively shot, processed, prepared, uploaded, keyworded many more images, most of which will never sell, and then spent marketing time and dollars to try and get those images in front of buyers. 2. Use an image which tells the whole story. People surfing the web are fickle. If it looks boring, they're off. Use an image that captures their interest and their in. What are those additional sales worth? Suddenly the alternative image can seem very cheap indeed. All the shop names have been blanked out. The faces have been blurred. Because many RF image suppliers would insist that the people could still be recognised, fancy bags have been obliterated and clothing altered.